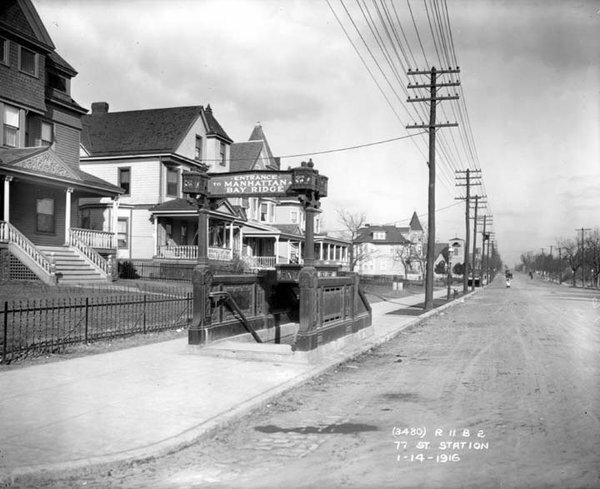 A century ago, what eventually became the R train made its first trip down 4th Ave. to Bay Ridge. Subway access to this seaside community in Brooklyn would forever change the neighborhood, and like many other NYC neighborhoods and subway lines, the history of Bay Ridge’s BMT is of unfulfilled promises. That subway, after all, never could find its way across the Narrows to Staten Island. These days, the R train is the line Bay Ridge residents hate to love and love to hate. Politicians are pressing the MTA to improve service that many say has fallen off since the Montague St. Tubes reopened, and I promise I’ll have more on that next week. In the meantime, for some three-day weekend reading, check out Hey Ridge’s paean to the R train. The neighborhood blog offers up more than you ever knew you wanted to know about the R train and its history. I highly recommend the post for its photos and the tale it tells about New York ambition then and now. Meanwhile, on the Sea Beach line, a massive overhaul of some very sorry-looking stations begins next week, and it’s going to mean backtracking and increased travel time. Details and more in this week’s service advisories. As a word of warning, check these carefully when you travel this weekend. The press release from the MTA wasn’t complete, and while I’ve tried to fill where I can, I’m sure I’ve missed something. From 11:45 p.m. Friday, January 15 to 7:30 a.m. Sunday, January, 17 and from 11:45 p.m. Sunday, January 17 to 5:00 a.m. Monday, January 18, Brooklyn-bound 4 trains run express from 14 St-Union Sq to Brooklyn Bridge-City Hall. From 6:00 a.m. to 11:30 p.m. Saturday, January 16, and from 8:00 a.m. to 11:30 p.m. Sunday, January 17, 5 trains run every 20 minutes between Eastchester-Dyre Av and Bowling Green. From 11:45 p.m. Friday, January 15 to 5:00 a.m. Monday, January 18, Brooklyn Bridge-City Hall bound 6 trains run express from 14 St-Union Sq to Brooklyn Bridge. From 3:45 a.m. Saturday, January 16 to 5:00 a.m. Monday, January 18, Hudson Yards-bound 7 trains run express from Mets-Willets Point to 74 St-Broadway. From 11:45 p.m. Friday, January 15 to 5:00 a.m. Monday, January 18, A trains are rerouted via the F in both directions between W 4 St-Wash Sq and Jay St-MetroTech. From 11:45 p.m. Friday, January 15 to 5:00 a.m. Monday, January 18, A trains run local in both directions between W 4 St-Wash Sq and 59 St-Columbus Circle. From 11:45 p.m. Friday, January 15 to 6:30 a.m. Sunday, January 17, and from 11:45 p.m. Sunday, January 17 to 5:00 a.m. Monday, January 18, Manhattan-bound A trains run express 59 St-Columbus Circle to 125 St.
From 6:30 a.m. to 11:00 p.m. Saturday and Sunday, January 16 and January 17, C trains are rerouted via the F line in both directions between W 4 St-Wash Sq and Jay St-MetroTech. From 6:30 a.m. to 11:00 p.m. Saturday and Sunday, January 16 and January 17, Manhattan-bound C trains run express 59 St-Columbus Circle to 125 St.
From 11:30 p.m. Friday, January 15 to 5:00 a.m. Monday, January 18, D trains are suspended in both directions between 59 St-Columbus Circle and Coney Island-Stillwell Av. F, N, Q, R trains and shuttle buses provide alternate service. N trains replace the D in Brooklyn between Atlantic Av-Barclays Ctr and Coney Island-Stillwell Av. D trains run express via the A from 59 St-Columbus Circle to and from Chambers St.
Free shuttle buses run between W 4 St-Wash Sq and Grand St, stopping at B’way-Lafayette St. Transfer between trains and shuttle buses at W 4 St-Wash Sq. For Brooklyn, take the N instead. Transfer to/from D trains via the passageway at Times Sq-42 St/Port Authority. From 11:45 p.m. Friday, January 15 to 5:00 a.m. Monday, January 18, E trains are rerouted via the F line in both directions between 21 St-Queensbridge and W 4 St-Wash Sq. Free shuttle buses run between Court Sq-23 St and 21 St-Queensbridge, stopping at Queens Plaza. From 12:01 a.m. Saturday, January 16 to 5:00 a.m. Monday, January 18, E trains run local in both directions in Queens. From 12:01 a.m. Saturday, January 16 to 5:00 a.m. Monday, January 18, F trains run local in both directions between Forest Hills-71 Av and 21 St-Queensbridge. Beginning 5:00 a.m. Monday, January 18 until Spring 2017, Astoria-Ditmars Blvd bound N trains skip 86 St, Avenue U, Kings Hwy, 20 Av, 18 Av, New Utrecht Av, and Fort Hamilton Pkwy. N trains will stop at Bay Pkwy and 8 Av. To 86 St, Avenue U, and Kings Hwy, take the Astoria-bound N to Bay Pkwy and transfer to a Coney Island-bound N.
To 20 Av, 18 Av, New Utrecht Av, and Fort Hamilton Pkwy, take the Astoria-bound N to 8 Av and transfer to a Coney Island-bound N.
From these stations, take a Coney Island-bound N to Bay Pkwy or Stillwell Av and transfer to an Astoria-bound N.
For New Utrecht Av-62 St, take the D instead. Transfer to an Astoria-bound N train at 36 St.
From 11:30 p.m. Friday, January 15 to 5:00 a.m. Monday, January 18, N trains are rerouted via the D line in both directions between Coney Island-Stillwell Av and 36 St. Free shuttle buses and R trains provide alternate service. From 3:45 a.m. Saturday, January 16 to 10 p.m. Sunday, January 17, Manhattan-bound Q trains run express from Sheepshead Bay to Kings Hwy. From 11:45 p.m. Friday, January 15 to 6:30 a.m. Sunday, January 17, and from 11:45 p.m. Sunday, January 17 to 5:00 a.m. Monday, January 18, 36 St-bound R trains stop at 53 St and 45 St.
For many visitors to New York, their last — or perhaps first — view of the #nycsubway is Sutphin Boulevard, a 26-year-old station that's already in bad need of a cleaning and repairs. Later this week, when I head off to France for my honeymoon, I’ll have a second opportunity in as many months to walk through one of the Archer Ave. Line stations in Jamaica. The E train will take me from Midtown Manhattan to Sutphin Boulevard on a schleppy ride that woulda-coudla-shoulda been faster had the Super Express plan every materialized, and I’ll head off to the AirTrain by strolling through a station that opened in late 1988 but somehow, less than three decades later, looks post-Apocalyptic. Somehow, we’re okay with ushering tourists into the New York City Subway by showcasing a station with water-stained walls, visibly dusty ceiling panels and inadequate exits. In one sense, the Archer Ave. subway lines is a quirk of history. It was designed to be part of a large-scale ambitious late-1960s system expansion that the city still badly needs. Very few pieces of that plan survived, and the Archer Ave. subway line was one of them — mostly due to the fact that Jamaica residents wanted to get rid of the elevated lines running through their neighborhood. Thus, the then-newly born MTA prioritized Archer Ave., and what opened in 1988 is a sign of the agency’s struggles to build anything on time, on budget and with any sense of aesthetics. In another sense, though, the Archer Ave. line is a clear sign that history is repeating. By delving into the archives of news coverage surrounding this subway line, we see some very clear patterns emerge. On October 23, 1973, work began on the Archer Ave. line — a three-stop extension of preexisting subway lines — and the MTA expected work to be completed by 1980 or 1981. Initially, the agency held firm on that 1980 projected revenue service date, but by the late 1970s, the date kept slipping. First, the MTA expected to open the line in 1983, and then, as the city struggled with its finances throughout the mid-to-late 1970s, the agency had to push back the opening date to 1985 or 1986. By the mid-1980s, the MTA and the feds were at odds over construction progress and quality. The federal Urban Mass Transportation Administration temporarily cut off MTA funding for both the 63rd St. tunnel and Archer Ave. extension over concerns related to leakage — a common theme in recent years — and concrete delivery issues. By then, it was clear that the opening for these new projects would be delayed again. Eventually, the Archer Ave. line opened in late 1988, and no one was impressed. News coverage focused on how Archer Ave. was a tiny part of a larger, unfulfilled plan and one that didn’t solve the region’s transportation issues as it went nowhere. The Times editorial board thought the MTA had overplayed its announcements of new service, and residents told the agency to stop tooting its own horn. Today, these stations are hardly crown jewels of the subway system. But what can we learn from Archer Ave.? Obviously, the need to invest system-wide in expansion and not just in piece-meal projects should be lesson number one. But lesson number two is that the system should not be starved of money for expansion simply because a project doesn’t open on time. We can look bad and sigh at this history, but when I ride the E to the AirTrain on Wednesday, I won’t really care that Sutphin Boulevard opened in 1988 instead of 1981. That’s ancient history to me and millions of New Yorkers who can enjoy the benefits, albeit limited, of construction from decades past. All of which is a 600-word parable to get us to today. At both Second Ave. and Hudson Yards, the MTA is struggling to meet deadlines. The 7 line extension is likely to open 20-22 months late, and the MTA is working furiously to fulfill a promise to open Phase 1 of the Second Ave. Subway by the end of 2016, already years late. Politicians are starting to notice as the delays garner more headlines and lead to grumpy constituents, but their responses are more worrisome than anything else. While speaking of the Second Ave. Subway last week, Councilman Ben Kallos had words about the neighborhood. “The businesses simply can’t survive, our constituents can’t survive an entire decade of construction,” he said. He’s not wrong, but the unsaid “or else” is more concerning. If no one can survive long construction projects, then any other future subway expansion is doomed. The MTA can’t use cut-and-cover construction so capital expansion efforts will require years of work. The 8 or 10 years on the East Side is less than the 15 it took to build Archer Avenue, and that just might be part of the cost of an expanded subway system. At Hudson Yards, where relatively few people have felt the direct effect of construction, Councilman Corey Johnson essentially threatened future funding. “It doesn’t inspire confidence of the city putting money into these projects if they’re not going to get done in time,” he said to NY1. Johnson’s comments underscore how politicians view capital projects not as long-term benefits but as ribbon-cutting opportunities. Here, the subtext is that if those who find funds aren’t in office to enjoy the headlines, they won’t deliver, future growth of the city be damned. I’ve said this before, but ultimately, the opening date of these projects doesn’t matter in the long run. In the short run, the city and MTA should better respond to concerns of residents and businesses suffering from the effects of life in a 10-year construction zone. But in the long term, the city should continue to fund growth. In 28 years, much like I won’t care on Wednesday about when Archer Ave. opened in the 1980s, no one on the Upper East Side will care that the first stops under Second Ave. opened a few months or a year later than expected. Starving our future over that delay is particularly short-sighted at a time when no one is leading on transit growth. For those New Yorkers of a certain age and certain background, the concept of an “authentic” city experience always seems just out of reach. We live in the era of super-tall buildings with $50 million apartments, brownstones in Bed Stuy that trade for $2 million, and a designer clothing store inhabiting the former home of the Ramones, Talking Heads and Misfits. Immigrants dressed as superheroes and cartoon characters are a far cry from Times Square’s halcyon days of strippers and drug addicts, and the East Village embodied by Jonathan Larson’s Rent is a distant memory. The Bronx is booming, not burning. For long-time New Yorkers, the city has lost some of the je ne sais quoi that made it special. Sure, it’s safe, and anyone who bought an apartment 30 or 40 years ago is sitting on a valuable investment indeed, but the grittiness of Old New York is no longer with us. It’s too safe; it’s too sterile; it’s too much of a playground for the rich. The cleanup efforts that started under Rudy Giuliani culminated in a 12-year Bloomberg mayoralty, and today, New York is a big booming city that’s pushing gentrification into areas that, 10 of 15 years ago, seemed impregnable and immune to the coffee shop-and-kale expansion. Nothing quite encapsulates New York’s rebound from the depths of Drop Dead 1970s quite like the subway. Today, nearly 6 million people per day ride the subways, but in the nadir of the 1980s, Crime — not of the “Showtime!” variety — breakdowns, track fires and derailments were the norm. The Bernhard Goetz shooting came to symbolize an era of unrest when subway ridership was sparse, and on one would ride late night through certain neighborhoods. Ridership in 1982 was 938 million; ridership in 2013 was 1.708 billion. We ride at 2 a.m. without thinking; thirty years ago, this was unimaginable. For younger New Yorkers, for transplants, for children of the late 1980s who came to New York for that authentic experience, it’s gone. The L train has new rolling stock and is packed to the gills 24/7. The J and Z trains ride through some gentrified and gentrifying neighborhoods, and a trip through East New York is simply a means to get to JFK or the beaches in the Rockaways. This is the New York of the 2010s; this is not New York of the movies. Kurt Russell escaped, and the city hasn’t been the same. Still, that desire for authenticity persists which leads me to Shaina Stigler, a 25-year-old performer who, according to reports, moved to New York in 2007 and this past weekend tried to recreate an era for which she wasn’t alive. When the Daily News first reported on the 1980s recreation set for a G train on Friday, I was inherently skeptical. While I’m no fan of the bank-ification of Manhattan real estate, development and growth should be encouraged, and for many reasons, I find fetishizing nostalgia highly problematic. It focuses on the image of grittiness without exploring what were deep-rooted crises and social ills plaguing the city. Stigler’s piece though was ostensibly art and a means for self-expression. In one sense, that drive to create and perform has been a part of New York through good times and bad and will always be an undercurrent in the life of the city. And yet, in reading, Sarah Goodyear’s wrap up of the subway takeover, I had the distinct sense that this was the 1980s through the lens of the privileged class of 2014 New Yorkers. Stigler claimed she wanted to recreat what Goodyear termed the “grimy, traumatic, and glorious ’80s,” but from the photos, this was heavy on the glorious, low on the grimy and traumatic. The 1980s in New York were not a rough time for everyone, but the adversity that Stigler mentions today involves waiting a few extra minutes for a G train that, thirty years ago, the crowd celebrating on Friday would never have ridden. The adversity of the 1980s included a crack epidemic and the AIDS crisis. It featured parents so overly concerned for their kids’ safety that some of my friends — native New Yorkers at that — took their first ever subway rides when we went to Yankee Stadium to celebrate my 10th birthday. This ain’t no party, David Byrne once sung, and it wasn’t. But we can remember through nostalgia too and hold onto parts of forgotten New York that made people want to come to the city in the first place. If we forget, do we lose that part as well? Dwelling on the negative without celebrating the positive will make us forget why we’re here and why so many people wanted to be here. Authenticity is ultimately what each person makes of it, and it’s a balancing act. Maybe there is no authentic New York and maybe there never was. Maybe authentic New York is what each person makes of it every day. It’s hard to believe, on one side of the coin or the other, that the MetroCard as we know it is celebrating its 20th anniversary this year. While the pilot launched in 1993, the first stations equipped with fare card readers opened in early 1994. Three years later, every subway station and bus were equipped with MetroCard readers, and four years later, Straphangers could take advantage of the promise of an unlimited fare card, thus ushering in a new era in booming transit ridership. I’ll spend some time looking forward next week. Tonight, I wanted to look back. For fifty years, the token reigned supreme, but these days it is only a memory. Many New Yorkers — those who moved to the city over the past 10 years — now the token only in the abstract. It was a thing some may remember as tourists as the keys to the subway while others hear of it only in city lore. For me, tokens were a part of my youth. I could flash my transit pass to the token booth clerk to gain entrance to the subway, but my parents weren’t so lucky. They kept piles of ten-packs of tokens in a shoe box in our linen closet, stockpiling them right before fare hikes. Tokens required planning and attention to the number of rides one might make during a day, and their brothers in arms — the flimsy paper transit for the bus system — always come with a pesky time limit. For all their symbolism, by the time of its death, the token was around for only half of the subway system’s life. For fifty years, so long as the fare remained the same as a Treasury Department coin, the city’s transit agencies could collect nickels and then dimes, but as soon as the fare went up to 15 cents, collecting coins become impractical. The first hints of a New York City subway token came in the early 1940s when the IRT purchased a bunch of tokens in the late 1920s in anticipation of a fare hike that never came. The company eventually ditched those plans, and the token would not emerge as a potential discussion piece until 1947. By then, the city knew it had a financial problem on its hands. The subways were bleeding money, and the various agencies discussed a token in conjunction with a fare hike. The transit deficit at the time was $84 million — or over $850 million in today’s money — and the proposals on the table ranged from 7-10 cents. Anything requiring multiple coins would have led the debut of a token. The Board of Transportation was not easily swayed. In an extensive July 1947 article discussing the looming transit referendum, The Times mentioned that BOT objected to tokens on that grounds that they can be “easy to counterfeit and bulky to handle.” In fact, the BOT was so concerned with slugs that many related to transit services planned to lobby the feds for an eight-cent coin in advance of the potential fare hike. When the fare hike became a reality in 1953, the New York City Transit Authority had to turn to tokens because some turnstiles were not equipped to handle multiple coins. Nearly immediately, the TA had to deal with the issue of slugs, fake tokens that would be a thorn in the agency’s side for fifty years. Furthermore, token clerks had to deal with surly, incommunicative customers and were instructed to avoid becoming “impatient, discourteous or abusive to the passenger.” By late 1953, one Times even urged the TA to sell tokens in bulk as little packages could make great birthday presents or stocking stuffers at Christmas. Ultimately, the token settled in for 50 years of use, abuse and redesigns. Its departure earned an obit, and New Yorkers’ pockets were lighter for it. Now we carry around a flimsy piece of plastic that one day too will become part of New York City subway history. The MetroCard may live a lifespan half that of the token, but it won’t make it to the venerable old age of 50. Few symbols in New York City do. The Routes Not Taken, Joseph Raskin’s thoroughly detailed an illuminating look at the various unbuilt subway routes that litter New York City history, begins with a simple premise: It is amazing that our subway system, in its present form, flaws and all, exists in the first place. We spend a lot of time imagining fantasy maps, pouring over details from lost and forgotten extensions and trying to catch a glimpse of the past’s future provisions. We never think about how we got to where we are today. After Raskin’s first chapter though, reality sets in. While the subway system somehow encompasses 468 stations and 722 track miles, the more tantalizing elements are those lines and extensions that never saw the light of day. The D train, for instance, ends at a stub tunnel at 205th St. that was supposed to be the Burke Ave. subway. Meanwhile, in Queens, the mystery of 76th St. runs deep on the Internet, and plans to send trains to College Point or even the Nassau County line remain a relic of the past. I’d urge any student of New York City history to read Raskin’s book. At times, it gets lost in the details as the author charts yet another community group meeting or business association that fights for a subway line. But those details are what makes this book so vital. New Yorkers fought for subway lines everywhere. They fought for subway lines down Utica and Nostrand Avenues; they fought for subway lines up and down the East Side. Raskin tracks each and every one of these fights, meetings, politicians’ positions and the myriad plans released by the Board of Transportation, the Board of Estimate and everyone else with a stake in the fight. What’s most telling to me about Raskin’s book are how so many of the themes resonant today. The biggest recurring problem is, of course, NIMBYism. We know and hate NIMBYism today, and the last 100 years of New York City history were no different. NIMBYs fought long and hard against elevated lines that, even 80 years ago, were a much cheaper way to extend the subway system. NIMBYs are why the East Side has been a near-transit desert since the 2nd and 3rd Avenue Els were torn down. But then some NIMBYs fought against underground lines too. Some groups wanted stations and routing shifted one or two avenues north, south, east or west. Others feared a few years of construction would disrupt street-level business. It was the ultimate in short-sightedness as today, and for decades, neighborhoods with subway lines are far better off than neighborhoods that successfully fought against them. Beyond the NIMBYs though were the deep-seated institutional problems that affected transit expansion. I found Raskin giving Robert Moses to many excuses toward the end of the book, but the man both threw up barriers to transit and took money away from it. He knew how to get his projects funded while both the BOE and BOT couldn’t deliver money for that Burke Ave. subway in the Bronx. Meanwhile, whenever a new subway extension would inch closer to reality, an interborough warfare would break out. The Queens Borough President would bemoan expenditures in the Bronx while the Staten Island delegation wanted its cross-Narrows subway before a Utica Ave. line would see the light of day. Ultimately, this fighting is why it took years for the old New York, Westchester and Boston Railway to become the 5 train’s Dyre Ave. line and why only a segment of the LIRR’s Rockaway Beach Branch is part of the subway. Finally, Raskin analyzes the financial realities that plagued the city as well. He dives into the controversy surrounding the 1951 bond issue. Hundreds of millions of dollars that were supposed fund a Second Ave. Subway went instead of modernizing an aging system. But the real problem was the fare. Since subway fares were so politicized, no one could stomach the blowback of raising the fares. By the time the city discarded the nickel, the subways were operating at a crushing loss, and the hope of using proceeds to fund any subsequent system extension were dashed. We dreamed big but never with any money behind it. So we return to the idea of our system today. It’s a marvel that it exists as it does and works as it does. But we need to move forward. If New York is going to grow, the subway must grow with it, and we know, from Raskin’s work, that the plans are out there if we dare to dream big enough. With the news that the Port Authority will spend at least $1.5 billion to send PATH trains to Newark Airport, the most rail-accessible airport in New York, I started thinking about Laguardia again. It is frustrating close and seemingly so far away. For anyone taking transit to the airport, the trip involves a circuitous subway-and-bus combination, and it’s been over a decade since anyone has mentioned a direct rail connection, monorail or subway, to the terminal geographically closest to Manhattan. They why of it involves a typical tale of New York NIMBYs and frustrating political processes. The Fiorello H. LaGuardia Airport in Queens is one of the nation’s most infuriating urban airports. In Queens, it’s tantalizingly close to the Bronx, Manhattan and Brooklyn — and of course, the subway — but it’s so far away because traffic congestion frequently creates trips to Queens that last an hour and 30 minutes from Midtown’s West Side. The only public transit options that delivery riders directly to the terminals are a handful of local buses and a a new Q70 limited bus. On a good day, for example, the M60 — recently denied Select Bus Service status — goes from 125th St. and Lexington to the airport in a half an hour. Over the last few decades, city officials have become quite intimate with the problems plaguing LaGuardia, and many have tried to fix it. The N train, whose northern terminus is less than three miles away from the LaGuardia terminals, is so tantalizing close to the airport and yet so far away. With the PATH extension back in the news, many are asking why we haven’t focused more on improving access to Laguardia. It isn’t for lack of trying as 16 years ago, city and MTA officials were heavily invested in a plan to extend the N to LaGuardia. In the face of other pressing transit needs, such as the Second Ave. Subway, and widespread community opposition, the agency eventually shelved this much needed link to LaGuardia. So what then were the plans that engendered widespread community outrage and still cause politicians to chime in now and then, over a decade after the MTA discarded the idea? Let’s hop in the Wayback Machine and explore some Giuliani Era transit developments. The plans to extend the N to LaGuardia first came to light in 1998 as city officials recognized the need to build better access to the airports. As part of a $1.2 billion package with funding coming from the MTA, the Port Authority and the city, Giuiliani put forward a plan to build an airtrain to JFK and extend the subway to LaGuardia. The JFK line — built over preexisting rights-of-way — survived. The LaGuardia plans, obviously, did not. The first and biggest problem the city faced in Queens came about because of the proposed routes. The preferred routing would have extended the N along 31st St. north onto Con Edison’s property at the edge of Astoria and then east along 19th Ave. to the Marine Air Terminal. The MTA also considered an eastward extension along Ditmars Boulevard. This involved a plan to reroute LaGuardia-bound N trains from Queensboro Plaza through the Sunnyside rail yard and along the eastern edge of St. Michael’s Cemetery to what Newsday described as “elevated tracks parallel to the Grand Central Parkway.” A barely-acknowledged fourth route would have seen trains head east via Astoria Boulevard. On the surface, these plans seem no worse than building the Second Ave. Subway through densely populated neighborhoods on the East Side. In Queens, however, the MTA would have had to build a spur line off a pre-existing elevated structure, and all of the plans called for the train to LaGuardia to run above ground through significant portions of Astoria. So while airport access ranked tops amongst Queens residents transit expansion wishlist, no one wanted to see Astoria further scarred by elevated structures. Chalk this up to a remnant of the 1920s and 1930s when New Yorkers objected en masse to elevated rail lines. At the time, the Daily News termed the opposition response NAMBYism — Not Above My Backyard — and nearly every single Queens politician opposed the idea. Some preferred the Sunnyside alternative, but at the time, NYCDOT said plans to widen the Grand Central Parkway would interfere with the train proposal. Others called for an extension from Long Island City to skirt the borough. Such a route would run from 21st St. along the East River to the airport. Still others preferred a longer Willets Point extension of the LIRR to the airport. In the end, despite opposition, political support for the plan from City Hall continued well into the 21st Century. With the backing of Mayor Giuliani and Queens Borough President Clare Shulman, the MTA’s 2000-2004 Five-Year Capital Plan included $645 million for the LaGuardia subway link, and even though a $17 million planning study was the project’s only expense, in late 2002, Mayor Bloomberg threw his weight behind the LaGuardia extension as a key post-9/11 revitalization plan. In Queens, local politicians voiced support for different plans. George Onorato had previously supported some spurt from the 7 line in Willets Point that avoided residential areas. Of course, in the intervening decade, the Mets placed a new baseball stadium in the way, and the city’s plans to develop Willets Point don’t include a rail extension to Laguardia. Never mind the fact that going to Laguardia via Willets Point is a time-consuming and circuitous routing that wouldn’t attract many passengers. And so in the end, we sit here with largely the same travel options to LaGuardia as we’ve always enjoyed (or suffered through). The Port Authority is set to spend $1.5 billion on a duplicative rail extension to an airport already served by Amtrak and New Jersey Transit, and the MTA is in no position to take another crack at sending the subway to the airport. Oh, what could have — and should have — been. I recently found myself exploring the voluminous image archives the Museum of the City of New York has made publicly available via their Collections website, and wow, is that a great way to get lost on the Internet for good chunk of time. They have, unsurprisingly, a good number of images showing subway construction and subway history, and I’m going to showcase some of my favorites in the coming weeks. The week’s entry is a glimpse inside the Canal St. station from around 1980. I love the old signage with the QB and RR trains, the Jennifer Convertibles add and the general sense of decay that pervades the station. A similar photo from this set shows signage from the time when both of the BMT Nassau St. platforms were in service. The western most set of tracks is now no longer in use but remains visible from today’s J/M/Z platform. The garbage can in front of the sign in that one is a nice touch. Streetsblog’s Stephen Miller shared this gem with the world via his Twitter account yesterday, and what you are seeing is a page from a 1937 children’s book that Fiorello La Guardia’s Committee on City Planning to introduce young New Yorkers to the concepts of urban life. It’s a great glimpse back in time, but so many of the issues — crosswalk safety, adequate airport space, zoning concerns — persist today, over 75 years after the book made its first appearance. My favorite page, of course, is the one about the Elevateds because it underscores how we’ve gotten to where we are today. The New York of the late 1930s had more transit routes than the New York of the early 2010s because of the elevated, but with those structures came noise, darkness on the ground and, of course, inconvenience for drivers. Even in 1937, as the illustration showed, cars deserved the space more than trains do. Today, we’re afraid of elevated. 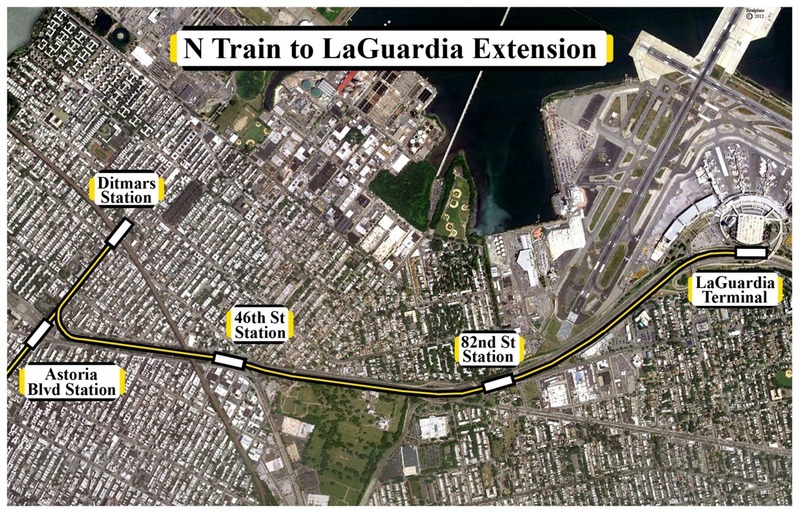 The planned train connection to La Guardia Airport died at the hands of NIMBYs who couldn’t stomach the idea of an elevated extension through Astoria even though technology, such as sound dampeners, and design have improved immensely since the BMT built the Astoria line. Now, we know why as an entire generation of future city planners were raised on a book that underscores the evils, but not the benefits, of elevated train lines. Postscript: I had apparently overlooked this, but the Tri-State Transportation Campaign beat us all to the punch. TSTC’s Joseph Cutrufo took a deeper dive into the book in a post last week and also noted things haven’t changed. He profiled the pages for bridges, omnibuses (the “most modern way”), roads and crossings.